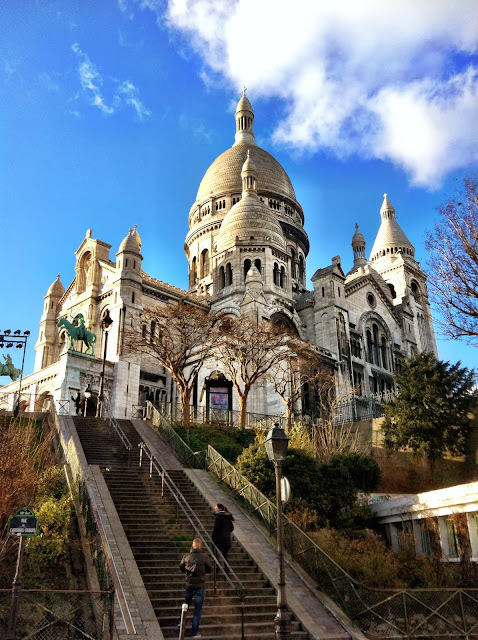 One of my favourite areas in Paris is the Montmartre area, the hilly quartier where Sacre Coeur perches up top overlooking Paris from its highest and most northern peak. Home to the studios and workplaces of many waves of artists in the past like Picasso, Van Gogh and Dali, this Bohemian area is one of the reminders of what old Paris used to be like, well, as best as it can anyway in 2014. The only thing I'm not a big fan of in this area is the fact that it can get crowded with tourists and by default, scammers and pickpocketers. I always find myself nervously anticipating when I'll have a clipboard or a friendship bracelet waved in front of my face and then thinking about how I should plan my escape strategy. This walk isn't your standard Sacre Coeur/Place du Tertre walk. So it does take a bit longer but I think it's worth it. 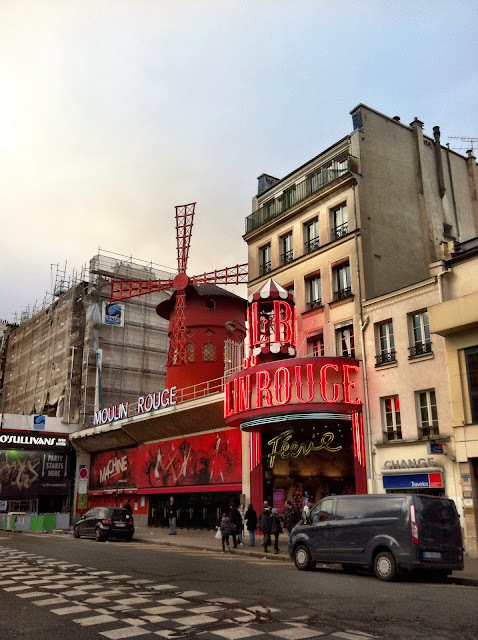 Ok, so once you've navigated your way past the Moulin Rouge area (depending on if you are coming from the Blanche/Pigalle way or Anvers way), head up the slope (rue de Steinkerque) past all those shops selling huge piles of bed linen, clothes, underwear and souvenirs. 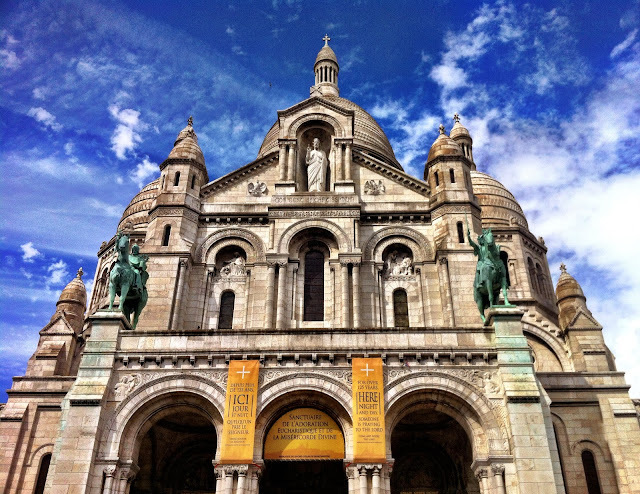 You'll reach the gates surrounding Sacre Coeur. Now, instead of following the crowds directly into the enclosed area past the carousel and up the stairs, (ie towards those scammers and pickpocketers), turn right just before the gates and take the side street. This way, you can take your time to meander up the hill in a long, uninterrupted, quiet stroll through the park. 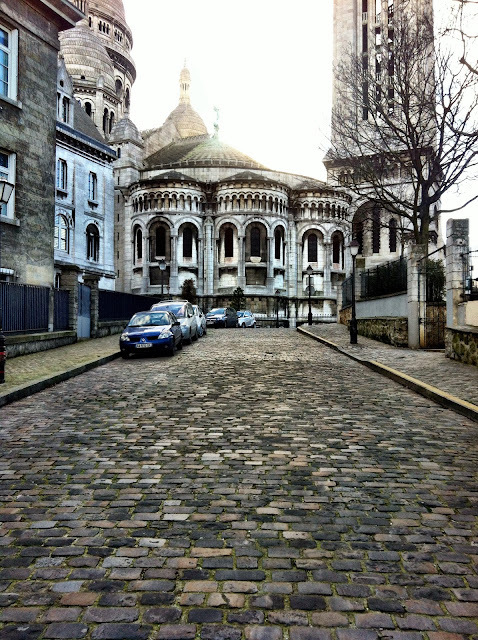 Up at the top, you can find beautiful cobblestone paths like this. Wandering in towards Sacre Coeur from behind instead of from the front was a nice way to approach it. And, if you stand still enough you can actually feel the clouds move / the basilica move towards you - it's a beautifully surreal experience, just hold onto a pole if you start getting dizzy. 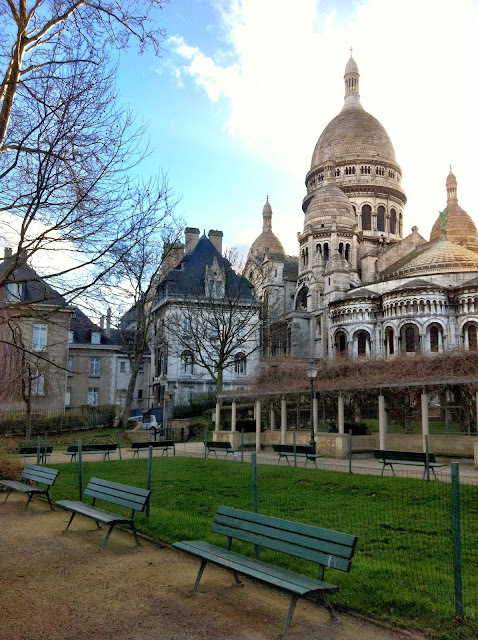 There's also a cute little park to be found just behind Sacre Coeur, towards the right with a backdrop like no other. After heading around Sacre Coeur, on its right side looking up the steps on the opposite side of the Funicular, you will find this view which captures considerably less tourists in your photo. 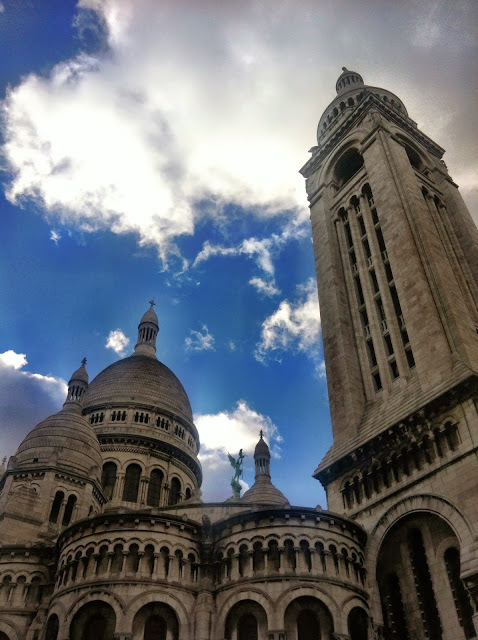 As opposed to this photo I took in Summer when I accidentally cut out too much of the Sacre Coeur while trying to cut out the people in my photo! 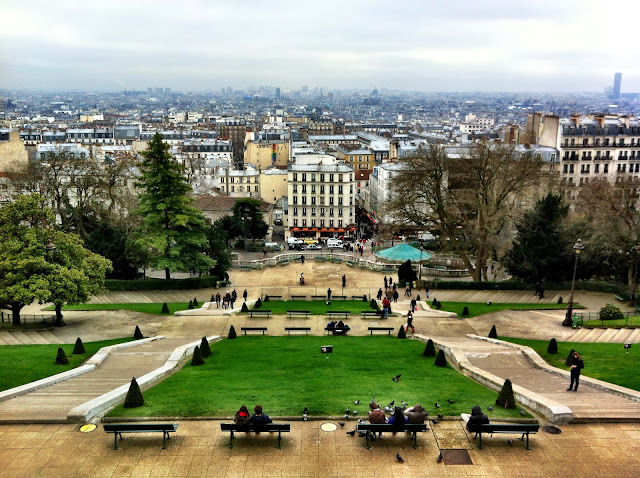 Nonetheless, the views from Sacre Coeur are pretty breathtaking, be it in Summer with more people or in Winter with less. 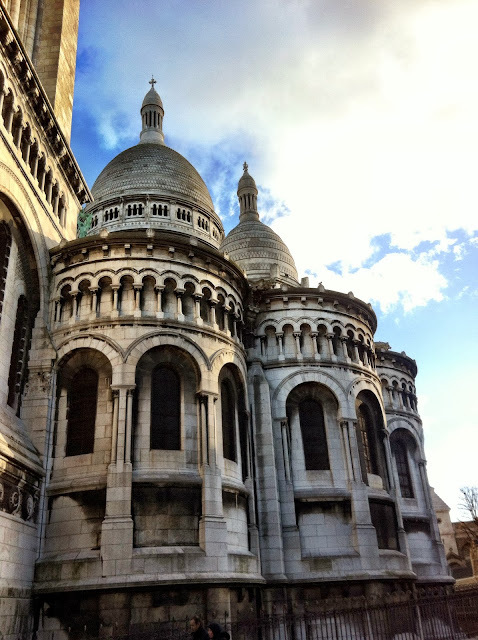 Back to the spot where we were on the right hand side of Sacre Coeur two photos ago. Standing here, if you turn around 180 degrees, you will be able to peer down this stairway and soak up the tranquility. Step to the side and you'll be able to see this. 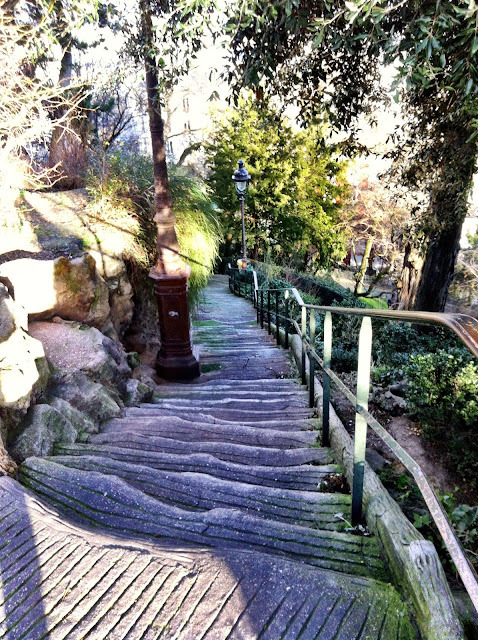 Take some stairs down like these to walk through the park. Then have a seat away from the crowds like this couple. Alternatively, if you had wandered towards the left side of Sacre Coeur (the funicular side) through Place du Tertre, you would have come across interesting stairways like this. 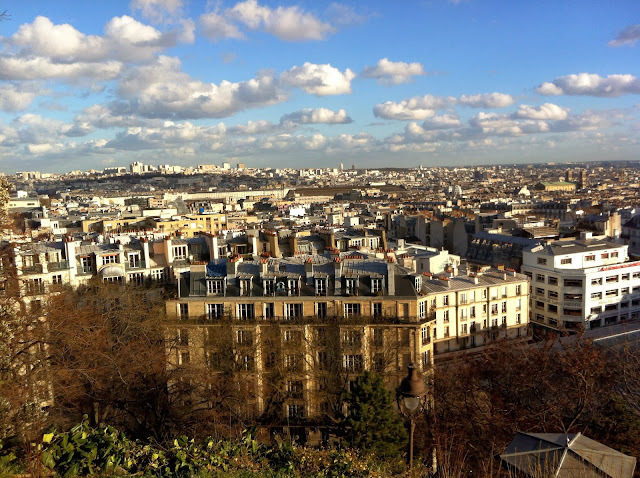 What I then like to do is wander towards Abbesses from the left hand side of Sacre Coeur. 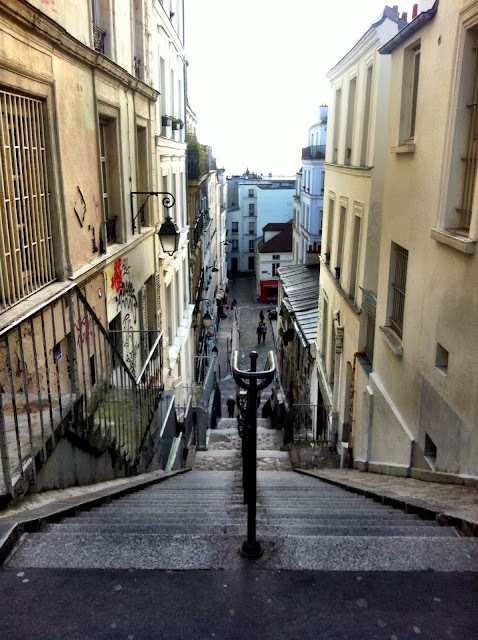 Take any stairway down and then head in the opposite direction of Sacre Coeur. 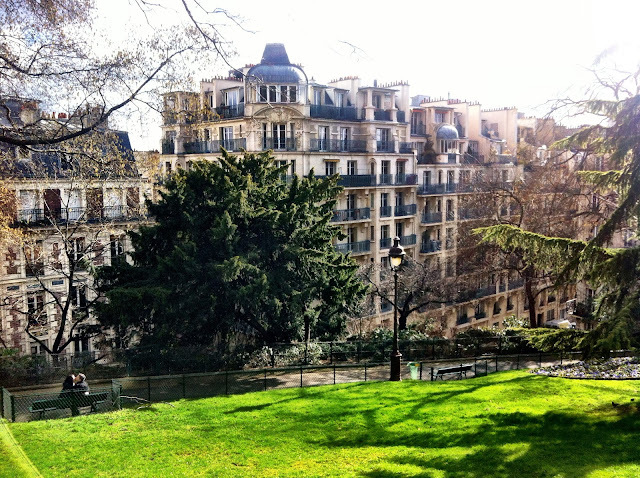 You'll slowly walk down the hill and around towards Rue Ravignan where you'll find some benches and stairs. 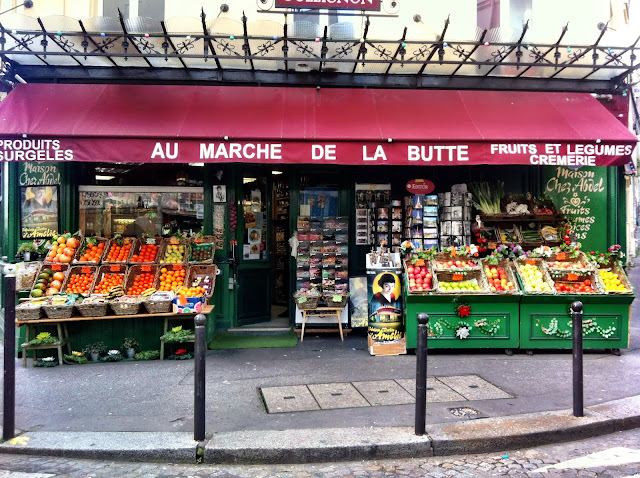 Turn left at the intersection and walk by the little grocery store on Rue des Trois Freres in the beautiful French film Amélie, Au Marché de la Butte. 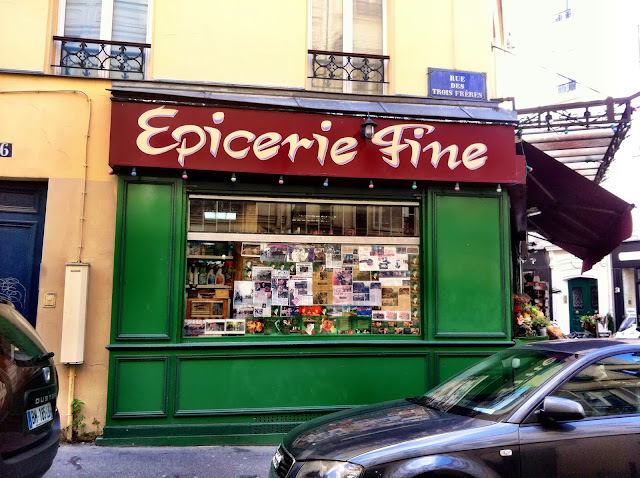 Follow the path downhill and you will find yourself walking on Rue des Abbesses and past the little Coquelicot boulangerie. To be honest it's hard to walk past that place without peering inside and buying something to take away. Your nose will lead you straight in, trust me. Once you've been able to tear yourself away from the boulangerie, you will see the Abbesses station. 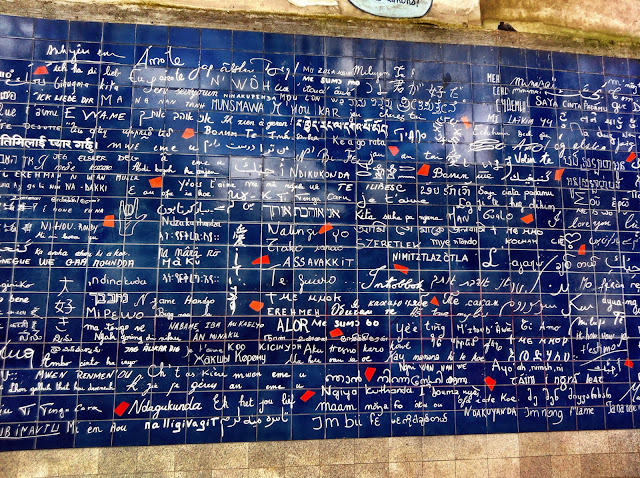 Head left towards Square Rictus and visit the wall of "je t'aime". See how many "I love you" translations among the 250 languages you can recognise! 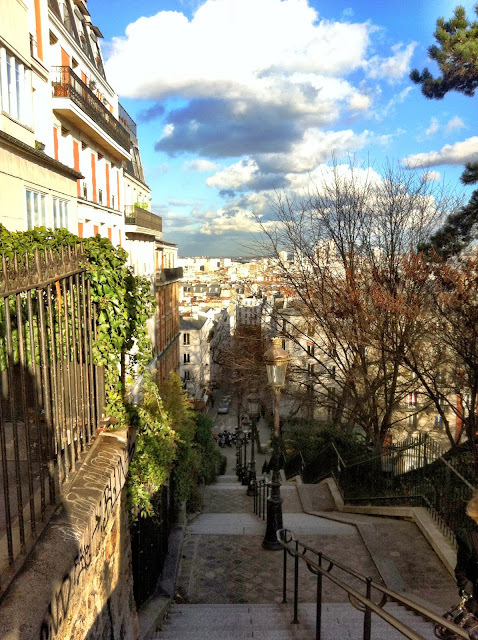 Exploring Montmartre in a leisurely way is a great way to spend the afternoon. There are so many little paths and alleys and stairways to choose from. Have a map handy so you can find your bearings quickly should you need to, but follow your instinct and choose whichever turn that takes your fancy. Sometimes getting lost is half of the fun! Your photographs are drop dead gorgeous! The photos in this article really touched my heart, Nhan. Thank you for printing such a beautiful view on my mind!!! All the very best for your future!